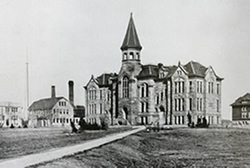 University of Wyoming, located in Laramie, Wyoming, admitted its first group of students in fall of 1887. 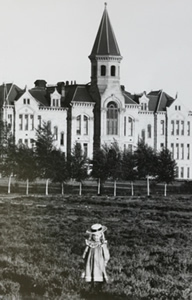 The original State Normal School for teacher preparation was located in Old Main, the first campus building. Three factors contributed to this development: the continual evolution and significance of the State Normal School to the preparation of teachers for Wyoming, the establishment and growth of the University Prep School, and a growing need for secondary education in the state. Under the new college, there were two departments: the Department of Elementary Education and the Department of Secondary Education. 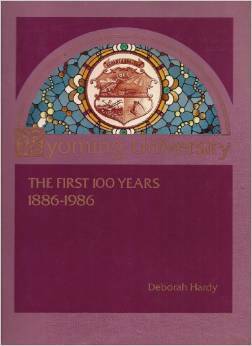 To read more about the history of the University of Wyoming, see Deborah Hardy (1986), Wyoming University: The First 100 Years 1886-1986, and Robert F. Nobel (1986), The College of Education: 72 Years of Teacher Preparation for Wyoming Schools. 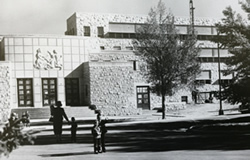 The current building in which the College of Education is housed admitted its first students in September, 1951. The Dean of the college at this time was Oscar C. Schwiering (Dean 1939-1954), father of Connie Schwiering, the well-respected Wyoming landscape artist. When the Education building was completed in the summer of 1951, dean Schwiering spoke with pride about the facility being one of the finest in the country, incorporating novel design features such as rich natural lighting and glass brick in the windows to diffuse heavy southern light. Today, this building is still home to administrative, some department and faculty offices, modern laboratories for art and computer instruction, and a K-9 university lab school. The lab school is now under the supervision of Albany County School District #1. The primary teaching facility for the college has moved into the adjacent Education Annex and remaining department and faculty offices are located in McWhinney Hall.